The Chocolate Muffin Tree: Paper Bag Puppets Inspired by Fandango!!! Have you ever heard of the Fandango Puppets? 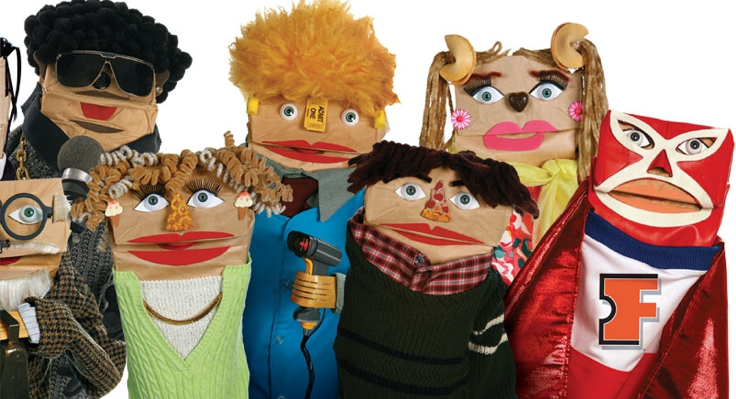 (I'm sure most of you have....) They are these great paper bag puppets from the Movie company Fandango that are designed with unusual items such as candy, pasta, straws, licorice, fruit pieces, and more....!!! Check out there website here to watch some of their videos. I remember first seeing these puppets on movie posters at the theater and later in the commercials and I always felt compelled to make puppets in this style. Cassie and I tried our hand at making these puppets and here is how they turned out. What do you think??? 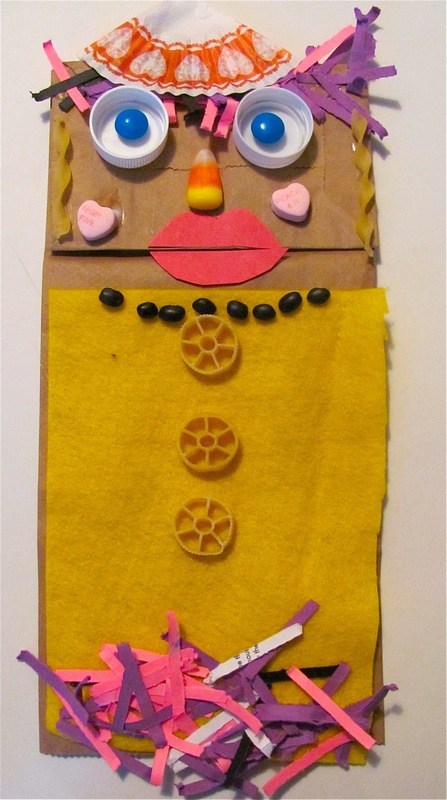 Keep reading to find out how you can make A FANDANGO Bag Puppet Online! Here are some actual Fandango Puppets. Aren't they great? The idea for these puppets came from creative director Len Fink whose many credits include the Coca Cola Polar Bears. The puppets are made by artist James Hayes who has designed for the Jim Henson Company (The Muppets!) No wonder I like them so much!!! To create these puppets we gathered lots of cool items such as pasta, candy, shredded paper, beans, fabric, bottle caps, yarn and paper bags, of course! For the lips we used construction paper.....which seems to be a definitive feature on all the Fandango Puppets. We used glue and scissors to add all the items. C having fun with the variety of materials! This is C's puppet. She used orange noodles for her hair and cheerio eyes! Can you see the resemblance? Do not do this project when hungry because she wanted to eat all the treats! This is my puppet. I had a lot of FUN! Now you can try making a FANDANGO PUPPET!!! Online or like we just showed you! The last puppet (the black haired one pictured in the first pic) we did together. It is kinda scary, but cool! ***If you want to try your hand at designing a Fandango Puppet without gathering materials or making a mess try the online game: FANDANGO Bag Puppet Creator!!! You'll have a blast! C had a lot of fun with it and made countless creations!!! Let me know what you think! wow, I hadn't heard about these and LOVE them, thanks for the fun idea! Glad you heard of them now! Your welcome Melissa! Super cute! I love this idea :-) We haven't done much with puppets yet and this looks easy for little ones. Thanks! Check out my next post for more puppet ideas (a round up) and you'll find more ideas Chrissy! Thanks.... I'll be stopping on by to share! I've never heard of them before, but love the idea. Online game is pretty good too! Your puppets are super cute! Thanks! Glad to introduce you to them and the game is awesome for sure! You are AWESOME! I'm in love with these, Melissa, and imagine they'll be all over Pinterest :) Wait, I'm pinning you right now! Thanks Rachelle! You are too sweet! I'll be checking out pinterest. Love love love! Enough said! Will be checking out the Fandango link you provided. Melissa, here you can find short review of this post http://kpanuba.blogspot.com/2012/01/2.html. Thank you for the great idea!